What are some alternatives to using dice in Settlers of Catan? In Settlers of Catan, there's a variant where instead of rolling the dice, you use a stack of 36 cards with each combination. This reduces the luck component, but has as disadvantage that you can predict future rolls to some extent. The iPhone Catan game also allows this rule variant. Have you tried this and do you think it's an improvement? EDIT: Have you tried other methods of reducing the importance of luck? The card system that you describe is not just a variant, it is an official expansion, Catan: Event Cards, which includes not only the rolls (in the form of the totals with the appropriate distribution) but also red dice for Cities and Knights and a selection of minor game events. I played a diceless variant where every village has a worker, we use glass beads to represent them. The game is very different from the original version, and very interesting. I haven't tried this variation, and to be honest, I don't think I would want to either. Randomness in games can bother me, but Settlers of Catan is one of those games where I don't mind the randomness. With the deck-of-cards variation, you know at some point in the next 36 cards that, for example, a 2 and a 12 will come up at some point, and if you can count cards, you can most certainly predict what the next results will be. Me, I rather be amused when we spend six turns in a row rolling a 3. That's just part of the game. The large majority of my games of Settlers, or more recently Cities and Knights, were done using a computer program to simulate the deck of 36 dice. It would randomly reshuffle at some point between 34 and 36 cards through, so you can't count rolls precisely, but it was a blissful solution to the frustration of the "Settlers probability distortion field". I much prefer Settlers played with "enforced probabilities" like this: there's still plenty of randomness in what order the rolls come up, but you at least know that building on a 6 and an 9 you will get more resources than the person who built on 4 and 11, where in the dice version the opposite seems to happen frustratingly often. The program we were using also provides for the Cities and Knights dice by colouring one number red, and giving a background colour of black (3 in 6) / yellow (1 in 6) / green (1 in 6) / blue (1 in 6). You can download it from http://members.lycos.co.uk/qqzm/downloads/Projects/Other/SettlersDice.zip. I bought the deck of cards, but everyone I play with just wants to roll dice. So I bought precision dice. 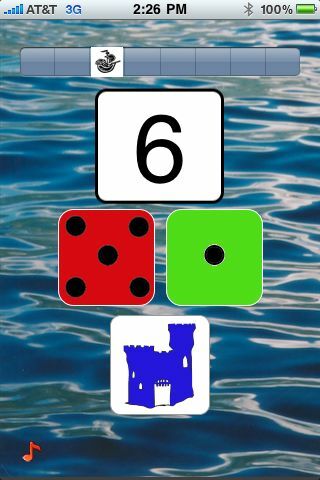 I use an iPod/iPhone Settlers Dice App. The benefits I see are: 1.) They're quiet, 2.) They're fast, 3.) They don't make a mess and get hung up on piles of cards or the edge of the board, and 4.) The probabilities are assured by the programming. The probabilities exactly match the theoretical probability of each dice roll, which is not the case with physical dice. I have used two iPod Touch/iPhone apps: "Settlers' Stats" and "Dice of Catan". "Stats" has a so called feature that allows you to track point changes of the various players. This turns out to be more trouble than counting again when you wonder. This app stinks. "Dice of Catan" is a different story. "Dice of Catan" (On the App Store) costs $0.99. 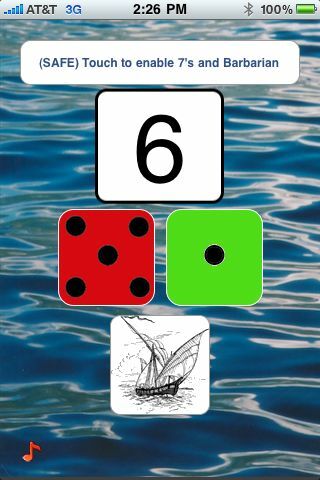 It is a very pleasant and simple app to use, and it takes the physical dice out of the game, which I think is a big plus. 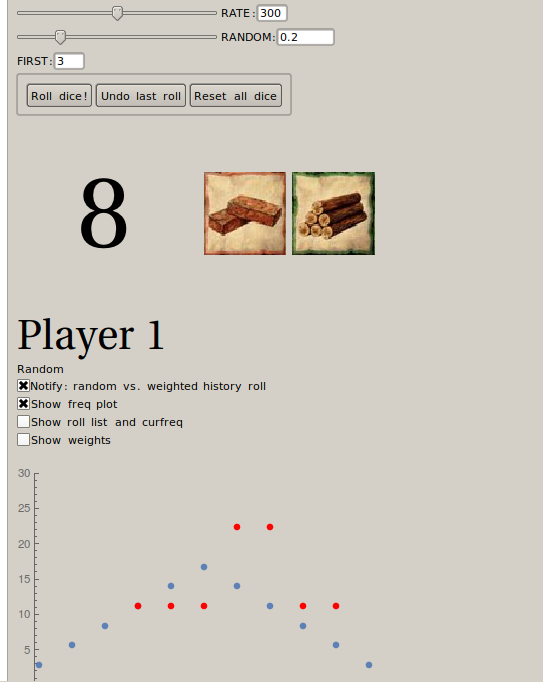 You tap the dice, and they display a pseudo-random (probability driven) Settlers of Catan roll. Features: Cities and Knights (C&K) support (has a die for barbarian movement/progress card.) Safe mode for early rounds, which allows no sevens (and no barbarian movement in C&K). Multicolored dice (one red, one green, see below.) Tracks barbarian movement and has a pop-up reminder for the Robber/Bandit and when the Barbarian strikes. Though with this method, people could predict things like "a 7 just came up, so it probably won't come up for several more turns", so there's also an option to effectively ``increase randomness''. With probability p, the dice roll will actually just be random according to correct distribution for 2 dice, and with probability 1-p, the weighted history will be used to roll the dice. This makes it much harder to predict things while still making sure the distribution converges pretty quickly. You can of course still predict things like "a 5 hasn't come up for a long time, so now it's due to come up". I've got (but don't use) and Android App called steady roller. It auto-adjusts the probabilities to even out the randomness, but in a less predictable way than the event deck / dice deck. I don't know its exact algorithm. You can also set it to reduce the chances of 7s, if you like that sort of thing. It's a freebie on the app market. We tried a variant where the amount of resources are produced according to the probability of the dice roll that would produce this resource. Say you've got an "8" and "3" on ore and a "12" on wood. Each players turn, after the dice roll (for bandit, barbarians and C&K) resources are produced in this way: to roll an "8" with two dice the probability is: 5/36, for a "3" it's 2/36 and for a "12" it is 1/36. So in each players turn you would receive 5 + 2 ore and 1 wood marker. If you reach 36 you immediately discard 36 markers and gain one card. This needs a lot of administration, but makes the resource management more planable and cuts off a litte from the importance of settlement/city placement. If a bandit enters a resource field, all players with a city or settlement adjacent to that field loose all their markers for that resource. 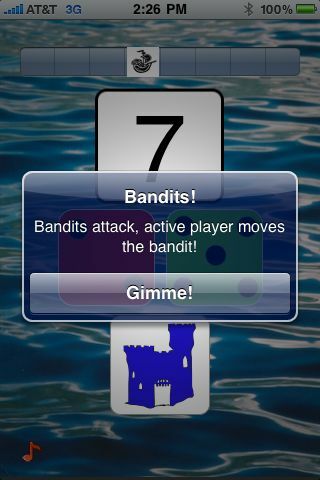 Other bandit rules still apply. You can do a similar version with development cards, where you have to gather development points according to your progress in this area of development (two for the first, one for each one after the first), but this leads to very fast or very slow developments, depending on the number of players. You would have to set the necessary development points to 36 to have the same average in developments as with dice. With barbarians and the bandit this works too. However we found that especially with development, barbarians and bandit, the randomness makes the game more exciting than annoying. So we roll the dice as usual, ignore resource production and carry out just the events development, barbarians and bandit. If you cut out all randomness (exept for the player influence) some strong players did manage to think ahead a number of turns and act accordingly, which left weaker or inexperienced players no chance. As @panavia pointed out, a weighted dice which re-weights the probabilities every turn based on the historical outcome is the best choice. The problem as I see it is that since one game is not long enough, the true distribution is never reached and events such as 3 5's in a row can have fatal consequences for the game. I wrote a post (click here) on the topic in cross validated with R-code for simulation. The problem with such variants is that randomness is one core part of the game. Yet, I'd agree that Catan depends too much on randomness. ...but isn't finding the "right degree of randomness" something extremely subjective ? I would suggest the 'dice results cards' system, but with variations to keep uncertainty. The official expansion already features a "new year" card, just move it earlier in the deck (like after 18/36 cards, instead of 31/36) This way, you'll just "soften" randomness, but keep the game away from an ugly a boring fully equitable distribution. Reducing/preventing "absurdity" like getting 4 ou 5 of a same result in a row, but keeping uncertainty and giving no guarantees looks like a decent compromise to me. I suspect the "Cities and knights" expansion might be another way of reducing randomness, since the games seems to require more dice rolls. Not the answer you're looking for? Browse other questions tagged house-rules catan variants or ask your own question. Is there a 10 player expansion for Settlers of Catan? Where can I get it? Are there any alternative rules for Settles of Catan to rely less on luck? Recording Settlers of Catan games? Creative handicaps in Settlers of Catan? What is optimal robber placement in Settlers? How to make Settlers of Catan quicker? How to encourage rolling two dice in Machi Koro?